The Academy of American Poets has unveiled the official poster design for National Poetry Month, which takes place in April. National Book Award finalist Roz Chast designed this year’s poster. The poster includes a line of poetry by the poet Mark Strand, who died last year. “Ink runs from the corner of my mouth,” reads the poster. “There is no happiness like mine. 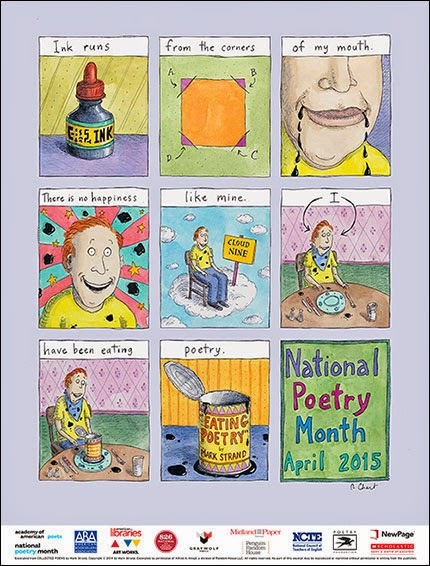 I have been eating poetry.” The poster will be handed out to more than 120,000 people in schools, libraries and bookstores during National Poetry Month. A special welcome to visitors from Brazil, Israel, Malaysia, the Netherlands, South Korea and Trinidad... Keep coming back! Most countries now have a "friend" feeling since you visit every month... Thanks so much!